Ladies and gentlemen, I present to you this day, two documents. Judge for yourself which of them is real and fake. Compare and contrast the Valid and invalid. Original and forged. Before you do that, permit me to give you the background of how it all started. There was a governorship election in Abia State on April 11th, 2015. That election was declared inconclusive by INEC on the grounds of irregularities in some local government areas in the state. That election failed to produce a clear winner despite that Dr Okezie Ikpeazu of the PDP was already cruising home with a wide margin of votes against Dr Alex Otti of APGA. 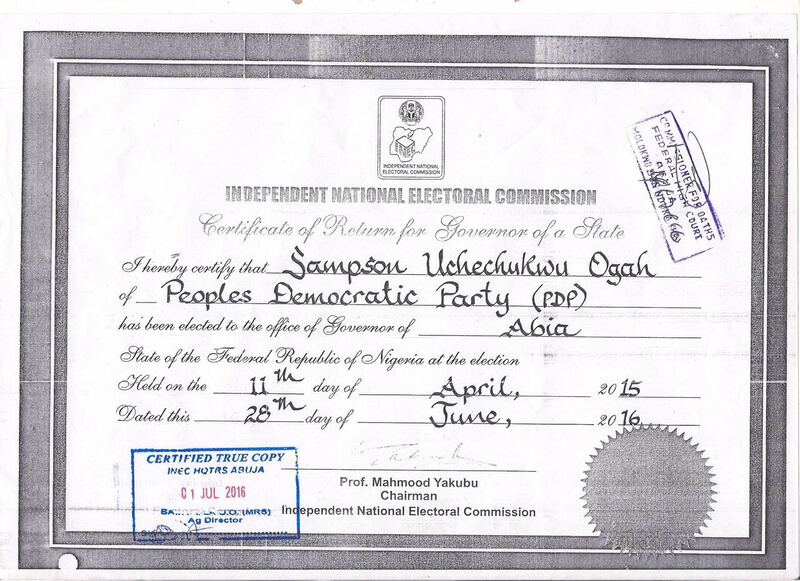 INEC called for a supplementary election in the affected LGAs on April 25th, 2015. 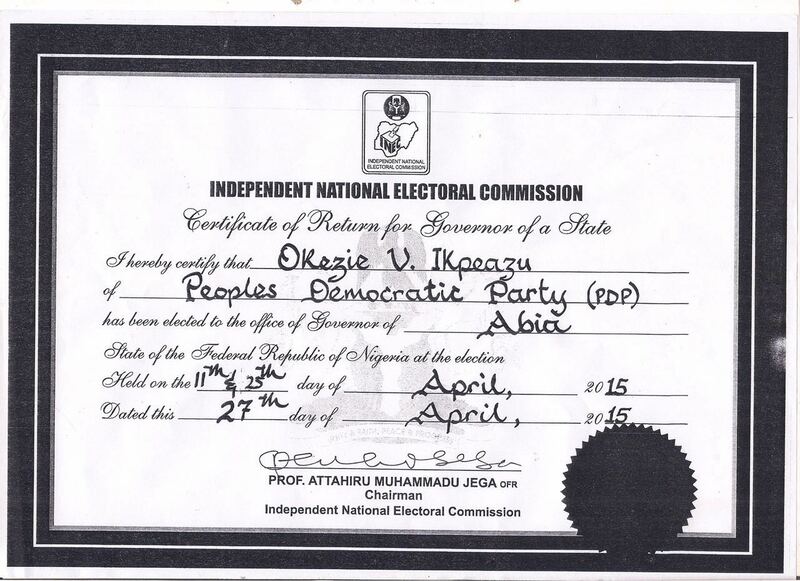 After the election of April 25th, a winner in the person of Dr Ikpeazu of PDP emerged as Governor-elect for Abia State, and he was issued with a certificate of return, bearing the two dates (April 11and 25) that elections held. Uche Ogar did not contest any of the elections. He could not have because, as a matter of fact, his name was never submitted to INEC as a candidate by any political party. As far as the 2015 Abia Governorship elections are concerned, Mr. Uche Ogar, is and remains an interloper. He is not known by moral and electoral law in the governorship election. This is another reason he is invalid and will continue to possess an invalid document. The election that produced the Governor of Abia State in 2015 is the April 25th election, and not the inconclusive April 11th election. If Ogar had contested the election, he would have known this fact. He would have also realized that the document issued to him by some agents of INEC is invalid. But as someone on the fast-lane, he lost his sense of reasoning. You can now understand why the failed civilian coup was plotted. You can also understand the rush by Ogar and his cohorts to invade the government house. But the coup failed. This conspiracy and evil plot has failed.